If you’re missing one tooth or several teeth, you’ve likely wondered whether there’s a solution that will restore your smile. Dental implants, available at May St Dental Centre, are the contemporary option to replace missing teeth. Missing teeth aren’t just a cosmetic problem. Though aesthetics are important to your self-esteem, missing teeth can compromise your oral health. When a gap exists, existing teeth can shift, which may lead to tooth loss. Bone loss is also a concern, as the gum tissue atrophies over time, leading to changes in your facial profile and giving a look of premature aging. You likely have a difficult time enjoying certain foods, too. Dental implants can stop these processes and restore your ability to eat the foods you want and speak with comfort. The majority of healthy adults can receive dental implants. Some health conditions may reduce their effectiveness. That’s why we ask you about your health history at your appointment, making sure that dental implants are suitable to meet your needs. Even those with health concerns are usually eligible, but we’ll want to account for any concerns you may have. Once we’ve completed an examination and decided that dental implants are the best way to achieve your goals, we’ll take X-rays and gather all the necessary information. If bone grafts or extractions are needed, we’ll perform those procedures first and allow you to heal before getting started. The titanium post is placed into the jaw. 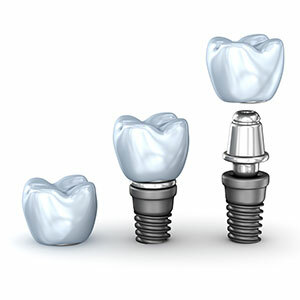 You can receive a temporary crown while we allow the implant to integrate. Then, you can have your permanent crown, bridge or denture affixed to the implant. We’ll check the fit and appearance and answer any questions you may have. Dental implants are intended to blend in among your natural teeth. One of the advantages of this is that you can brush and floss them in a similar way as you would with your regular teeth. While implants never get cavities (and never need root canals! ), you still want to continue brushing and flossing to keep the gum around the implant and your natural teeth healthy. Show off a gorgeous smile. Contact us today to make an appointment for dental implants East Fremantle!